Thanksgiving is over, so back to work! 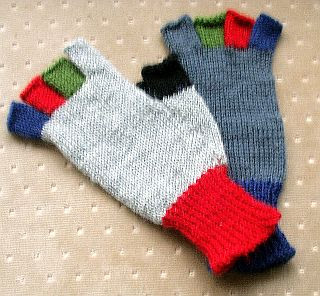 The fingerless gloves are done! Washed and kind of blocked. They're ready to be boxed up. Rug one of two is complete. Two commission pieces: 34 x 60. 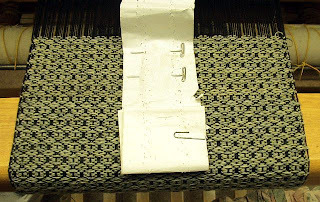 Sett 12 denim cut 1" wide Hem woven 3" at each end. Queen's Cord by M. Davison: photo of the underside. 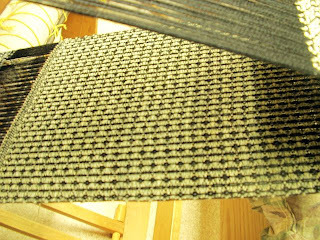 Sett 20 black rayon Weft is a gray-ish green wool. Oh, it's a scarf! The right side with my ratty looking measuring devise. Bob's second pair of socks will be finished tonight. I forgot to carry the "clock" down into the foot as I did on the first pair. I could drop back and turn the knits to purls, but I won't. He won't care and probably will never notice. I've joined Ravelry and it's a giant black hole in regards to my time. 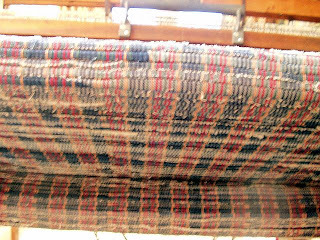 Yesterday I got the first of the two rugs woven. Today? Woven in the first hem for the second rug and have uploaded some photos to Ravelry and read other member's profiles and lists of projects. I must pull back and read Ravelry less frequently and save it for after the holidays. Ah, nice eye candy Marie. Knitting I get, weaving is still a reach. Thanks for sharing your projects. I hope this year that weaving will become more second nature, as it seems to be with you. Productive as usual, I see! Your description of Ravelry is exactly why I resist joining. I need a "I'd rather be weaving" sticker for the back of my computer chair as it is. So, who nailed your feet to the floor?